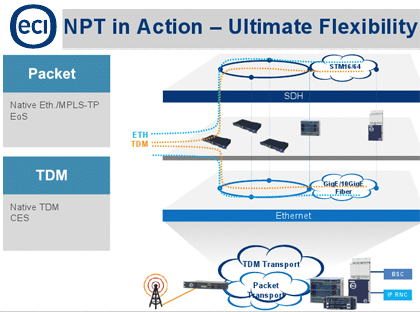 ECI Telecom introduced five new Native Packet Transport (NPT) platforms with multidimensional flexibility (capacity, interfaces, protocols) for handling both Ethernet and native TDM traffic in metro networks. thousands of network elements (NEs) across the metro. ECI’s Native Packet Transport platforms are managed by the company's existing LightSoft network management system, which ensure unified multi-layer management for MPLS, WDM and TDM. The NMS offers GUI-based operation, enabling the packet transport network to be as easily managed as existing TDM-based transport networks. Plexxi, a start-up based in Cambridge, MA, introduced a Software-defined Networking (SDN) data center switch that creates network connections by implementing efficient topologies based on actual workload needs and by scaling with a proprietary "LightRail" optical interface between switches. Plexxi is targeting cloud and virtualized data centers. The aim is "a system that directly manifests workload-optimized solutions in the real, physical network, creating a network that delivers to applications what they need, when they need it – every time, all the time." Plexxi Control is server-based software that dynamically and continuously computes connectivity for actual workload needs. It provides SDN-based affinity-driven network orchestration, management, and control software. The multi-tier SDN controller architecture uses distributed processing at the edge of the network for scale and performance and centralized knowledge for topology planning and optimization, achieving incremental performance as the network grows. 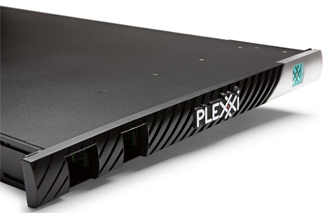 Plexxi Switches provide standard high-performance, low-latency 10Gb and 40Gbps Ethernet access connections, but interconnect with each other via Plexxi's high density, high capacity "LightRail" optical interface. 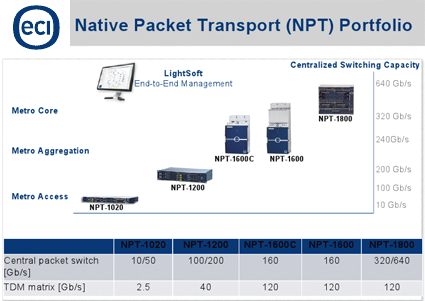 The patent-pending LightRail interconnect system provides 400 Gbps of dynamically assignable core capacity per switch, scaling linearly with each switch, achieving, for example, 100 Tbps in a 250-switch network. The LightRail interface eliminates additional layers in a data center network. Plexxi Switch 1 starts at $64,000 including all inter-switch optics and cabling; Plexxi Control starts at $5,000 per Switch. Monthly pricing options are available. "Big data, mobile and XaaS are bringing on new application connectivity requirements and more intense workloads at an accelerating pace. Legacy network switching architectures cannot respond to application needs," said David Husak, CEO of Plexxi. "Networking doesn't have to be this hard or frustrating. With 97 percent of the cost and complexity invested in today's networks providing zero value, Plexxi is on a mission to replace this mess with a complete SDN system for the data center – designed from the ground up – that makes networking simple, efficient and transparent." Plexxi is backed by Lightspeed Venture Partners, Matrix Partners and Northbridge Venture Partners. The company has raised over $48 million in funding to date. 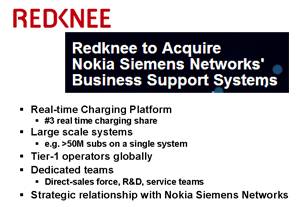 Redknee agreed to acquire Nokia Siemens Networks’ Business Support Systems (BSS) business, which provides real-time charging, rating, policy, and customer care solutions to more than 130 communication service providers, for EUR 15 million in cash at closing, plus a maximum of EUR 25 million for certain performance-based cash earn-outs expected to be paid over 12 to 36 months post-closing. NSN claims half of the top 100 global mobile operators are users of its BSS platform. The deal includes customer and supplier contracts, intellectual property rights, fixed assets and associated liabilities, along with BSS employees. Nokia Siemens Networks plans to retain a small number of broader customer contracts that include elements of BSS for GSM-R and mobile broadband related mediation. The employees expected to transfer to Redknee are mainly based in Berlin, Germany; Bangalore, India; and Wroclaw, Poland. Redknee is also a supplier of software and services that help operators to monetize the value of each subscriber transaction. Its revenue generating solutions provide advanced converged billing, rating, charging and policy for voice, messaging and new generation data services to over 90 network operators in over 50 countries. Redknee is based in Missisagua, Ontario, Canada. "This planned transaction supports our transformation to focus on mobile broadband. Both Redknee and Nokia Siemens Networks have a reputation for high quality and customer commitment, which provides a common foundation for Redknee to build the BSS business in the future. We will work with Redknee to ensure a smooth transfer of the business and to provide some mobile broadband specific elements of the BSS portfolio to our customers," stated Rajeev Suri, CEO of Nokia Siemens Networks. Earlier this week, Nokia Siemens Networks will sell its Optical Networks business unit to Marlin Equity Partners. In November 2011, DragonWave and Nokia Siemens Networks reached a deal by which DragonWave acquired NSN's microwave transport business, including its associated operational support systems (OSS) and related support functions, in a transaction potentially worth up to EUR 110 million. Emulex announced an offer to acquire Endace, a supplier of network visibility infrastructure, for approximately $130 million in cash. Endace, which is based in New Zealand, supplies Intelligent Network Recorders which capture, index and record 100-percent of network traffic while scaling from 1 Gbps to 100 Gbps. Endace's proprietary web-based application enables engineers to visualize, search and retrieve network traffic from any Endace Recorder anywhere across the network. In addition to network probes, Endace also offers a 40/100 LAN/WAN network visibility fabric. Emulex supplies Fibre Channel Host Bus Adapters, 10Gb Ethernet Network Interface Cards, Ethernet-based Converged Network Adapters, controllers, embedded bridges and switches, and connectivity management software for servers. Emulex is headquartered in Costa Mesa, California. 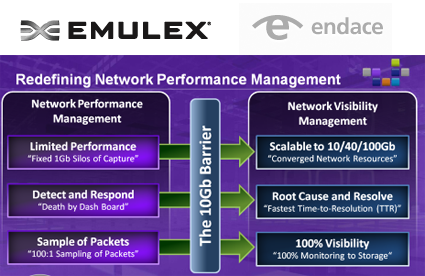 Emulex said the combination of its software-defined convergence architecture and Endace’s network visibility infrastructure will provide organizations with new and innovative ways to solve the challenges of network complexity and ensure application-level performance at speeds of 10Gbps and above. "This acquisition provides Emulex with a strategic entry point into the network performance management space at a disruptive point in time, as speeds move to 10Gb, making network visibility from end-to-end a critical requirement in a converged network environment,” said Jim McCluney, chief executive officer (CEO), Emulex. "Acquiring Endace aligns with our software-defined convergence strategy, doubles our total addressable market and places Emulex in another high-margin, high-growth market. Excluding transaction related expenses, we expect the acquisition to be neutral to our non-GAAP earnings per share for fiscal 2013 and accretive at the beginning of fiscal 2014." Qualcomm Atheros unwrapped a new ultra-low power near field communication (NFC) system-on-chip (SoC) for mobile devices. The QCA1990 boasts an overall footprint that is 50 percent smaller than current NFC chips, making it the smallest on the market. It can be paired with Qualcomm Atheros' WCN3680 1-stream, dual-band 802.11ac Wi-Fi/Bluetooth 4.0/FM chip, the QCA1990 will enable seamless user experiences in the mobile, computing and consumer electronics markets. It also offers platform-level integration with the Qualcomm Snapdragon S4 and next-generation processors and modems to seamlessly enable NFC on Qualcomm's OEM partner smartphones and tablets. 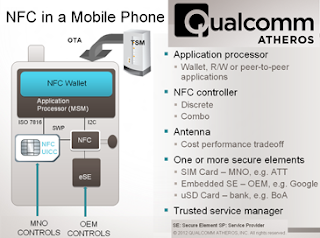 "Qualcomm Atheros believes NFC will be another key element of an enriched experience for smartphone and tablet consumers. As consumers continue to adopt functions like mobile payments and contactless data exchange, Qualcomm intends to be at the forefront of delivering simple, easy-to-use solutions to OEM partners," said David Favreau, vice president of product management, Qualcomm Atheros. " 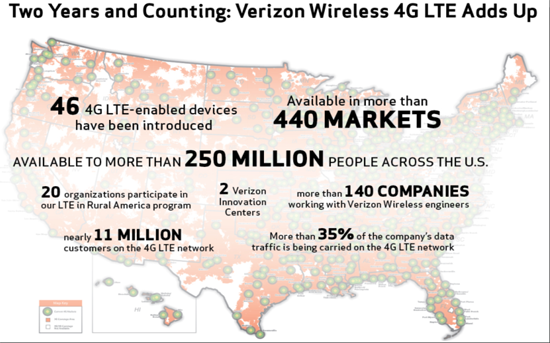 More than 440 markets with LTE coverage in the U.S.
20 other mobile operators participating in its LTE in Rural America program. 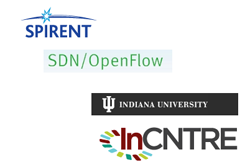 Spirent Communications is working with Indiana University’s Software Defined Networking (SDN)/OpenFlow research organization, InCNTRE, to develop the conformance test suites within OFTest, an open source based test solution for OpenFlow networks. OFTest is a Python-based conformance-testing framework, built on Open Networking Foundation’s (ONF) OpenFlow standards. It is designed to test the conformance of Ethernet switches in high-security and IP-based mobile networks. Spirent said its iTest, an integrated test authoring and execution solution built for testers, developers and automation teams, is providing automation support for OFTest. CipherCloud, a start-up based in San Jose, California, announced $30 million in new venture funding from Andreessen Horowitz for its cloud protection. 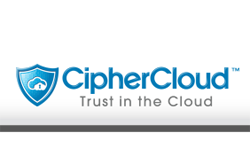 CipherCloud provides cloud encryption and tokenization gateways to help enterprises to securely adopt cloud applications by eliminating concerns about data privacy, residency, security and regulatory compliance. The company said it is currently protecting 1.2 million cloud application users and 100 million customer records for more than 40 enterprise clients across eight countries. The CipherCloud product portfolio supports popular cloud applications including Salesforce, Force.com, Chatter, Google Gmail, Microsoft Office 365, and Amazon AWS. Customers include top firms in banking, insurance, healthcare and technology, as well as government agencies. CipherCloud’s existing investors include Andreessen Horowitz, Index Ventures and T-Venture, the venture capital arm of Deutsche Telekom. Broadcom narrowed its financial guidance for the fourth quarter of 2012 toward the higher end of its previously stated range, or approximately $2.00 to $2.10 billion, due to slightly better-than-expected revenue in ots Mobile & Wireless business. The company said its Product Gross Margins should also be up slightly compared to the previous quarter, while expenses are down approximately $5 to $15 million from Q3 '12, due to lower-than-expected headcount costs.